the republicans came across as being racist, until they show that we are all created equal they will never win another election, they will never have my vote ever again. This is why I hate the Republican party they talk about the way Obama raised money on the internet from small donors but now they act like there coming up with a new concept. I hate them, I really really do. They won't give Obama any credit but they will come out and take all his ideas but the bottom line is there dirty, prejudice and I still will never ever vote for a Republican. 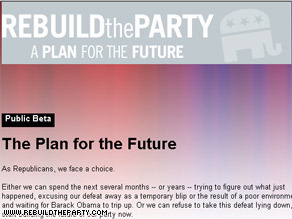 Adopting Obama online model will not help the RNC to rule unless the RNC has good messages for all not just for some. The RNC will never be the same. How will the internet help them? Half of the Republicans who post responses here can't write; the other half can't read. Uh...when did the internet come out??? Way to be ahead of the curve, G.O.P. Make the Republican party the party of state and individual rights, small government, and low taxes. Give the religious zealots their own party. Eliminate the term "Conservative" entirely and attract people who are more interested in individualism and freedom than upholding theology and morality. A lot of republicans in the true sense (state and individual rights), voted for Obama simply because of the religious, morally overbearing attitude of the current republican party. To the GOP,take your idiotic blind folds off,this is 2008,21st century technology age,and now you're looking into the internet to reach your party. WOW!!!!! TALK ABOUT BEING OUT OF TOUCH. This is the smartest thing that I've heard from the GOP this entire year. They really need to spend time finding out what the hell they represent. 20th century conservative social and economic wars are sooooo obsolete. Ask John McCain...everytime he mentioned Tip O'Neil and the great Ronald Reagan during the debates, you could hear the groans and moans from sea to shining sea. The youth of these conservatives exposes their naivete. The internet is just a tool, and becoming more competent at using it is not going to change the fortunes of the party. They've got to come to grips with this: Barack Obama was by far the superior competitor in the presidential contest. He is the best politician on the scene now. If the Republicans come up with a stronger candidate than Obama, mastering the internet will be side issue. Am I hearing right....are they actually admitting to the genious of President elect Obama??? Can't wait to hear how Rush Limbaugh will spin this! All the computer knowledge in the world won't help the GOP unless they distance themselves from the hate mongers in their party. He has a lot for most of us to emulate. This can be so good folks if we all commit to it as our president elect has. Very exciting when you think of the possibilities ! IF WE LIVE THAT LONG I CAN'T WAIT UNTIL THE 2012 ELECTION!!! It won't work if you maintain your conservative views. So long as you preach about how everyone is your enemy, then we will remain your enemy. The time for unity is at hand. The time for childish "he's a terrorist' fear tactics is over. Speculation, conspiracy theories and deception are the tools of a weak and incompetent mind. I suggest you start with adopting Obama's integrity before you adopt his online savvy. Your party has acted like a cult these past 8 years, and it's very frightening! I left the GOP for that very reason. Truth is, the GOP needs to drop the conservatives all together, they are the cancer that is in that party. They are an anti patriotic hate filled base of truely dispicable people. I am an independent, who proudly cast his vote for Barack Obama. However, I acknowledge the need for two parties, and right now there is only one and a half. If the Republicans want to become legitimate again, they need to cut out the fear-mongering, the negativity, the deceit, and yes, get with the times. The internet hurt the Republicans in more ways than one. The other less often discussed factor is how much harder it is now to deceive the voters who are able to check the facts for themselves. They overplayed the Ayers card, and it didn't work, because we can go right to our computers and find out the truth. Then they just look silly. It will be interesting to see just how the Republicans go about remodeling the party, but whatever they do, they had better start offering real solutions instead of just rhetoric, or else some other party will replace them. As long as this "rebuilding" of the RNC involves kicking out Sarah Palin forever....then I'm all for it. All I can do is laugh at the uber right wing comments. I think all the reasonable folks out here should just cease with the comments on this one and let the radical right have at it with each other...it's almost as entertaining as SnL was. VOTED! OBAMA!!! VOTED! OBAMA!! VOTED! Monica, loved your comment! I couldn't agree more with it!! I would hope in rebuilding the party you try and include the "face of America" because watching McCain concession speech it look like a Klan rally without the sheets and watching Obama's rally showed what Ameria is White, Black, Hispanic, Puerto Rican, Asian, Old, young, Gay, Straight, Disabled, etc. THAT'S AMERICA!! And until the republican party realize this your party will never be what it was, actually you shouldn't want it like it was. As long as the party considers the task of rebuilding as a 'war,' there's no hope for our country. Haven't we learned anything from this campaign? How about not being such a bunch of fcking dcks? The goal of the corporate heads of the republican party is to keep their base ignorant and ill-educated so that they can take advantage of them at election time in order to pursue their goal of facism disquised as democracy. They will use religion, guns and abortion in their continued efforts. If they keep this up they will be a completely dead party within 10 years. The conservative heads of party met today and it sounds like they are going to double down on the right-wing stuff they have been stuffing down our throats. They do not get it. In order to get even half way back they are going to have to get rid of religous right and move back to the center. They have it in their heads that we are more to the right of center; we are not. Most of the country is either to slightly to left and right of center but most of us are there. Why they keep pandering to the far right is beyond me but as long as do I will never vote for a republican again. The Young Conservatives fail to realize that copying one of the Obama Campaign's tools is not going to turn the Republicans around. Strong and positive leadership is what the Repubs need...like Obama! If (a) the Republicans pick Palin to be a party leader and/or (b) nominate her as the party's presidential candidate in 2012, then Obama could mail us all his new puppy's poops and he'd still be elected in 2012. Give it up with her. She may be beautiful, but a pretty moron is still a moron. The Reps need an entirely new face. One that didn't spew the dumb answers and virulent filth she spewed during her campaign. GOP needs to re-inspect their value system. They were misled by Bush and Oil-CEO group to focus on special interests of a small group. They need to look after the majority of Americans. Hope that they learn their lesson.